- Publisher Spencer Houghton Cone (1785-1855) is a name unknown in the secular world and not well known to the Christian community, but a name known to God from all eternity. In fact, this is the name of a man destined to be one of his chosen vessels, gifted and raised up to accomplish great things for the kingdom of God. Alongside others, Spencer Cone faced the challenges of his day such as the contentious issue of slavery, the need to encourage missionary endeavour, and the accuracy of Bible translation. In all situations he contended for the Faith with conviction and commitment. A natural leader, he occupied a position of prominence on every committee or in every organization of which he was a part.This is the life story of a wonderful man of God who lived through troubled times as a pastor in New York. It is about a marvellous conversion, overcoming hardships through faith, the power of preaching, and the influence of a godly life. Spencer Cone loved Christ and devoted himself fully to his service. This book is an inspiring read of one of whom the world was not worthy. - Publisher John Thornbury lives about ninety miles from Gettysburg, Pennsylvania where nearly 150 years ago the decisive battle in the great struggle known as the Civil War was faught. Bronze statues stand there representing the brave men who faught, and in some cases, died for what they believed. This book gave the author an opportunity to rediscover and present to our generation the life of a wonderful man of God who lived through these troubled times and who has suffered an undeserved anonymity: Spencer Houghton Cone. This is a story about a marvellous conversion, overcoming hardships through faith, the power of preaching, and the influence of a godly life. This book is not fiction, it is sober history. It tells of what actually happened, true stories of courage and faith. Such should nourish your inner spirit. 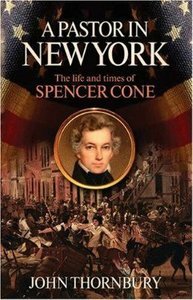 About "A Pastor in New York"
Spencer Houghton Cone (1785-1855) is a name unknown in the secular world and not well known to the Christian community, but a name known to God from all eternity. In fact, this is the name of a man destined to be one of his chosen vessels, gifted and raised up to accomplish great things for the kingdom of God. Alongside others, Spencer Cone faced the challenges of his day such as the contentious issue of slavery, the need to encourage missionary endeavour, and the accuracy of Bible translation. In all situations he contended for the Faith with conviction and commitment. A natural leader, he occupied a position of prominence on every committee or in every organization of which he was a part.This is the life story of a wonderful man of God who lived through troubled times as a pastor in New York. It is about a marvellous conversion, overcoming hardships through faith, the power of preaching, and the influence of a godly life. Spencer Cone loved Christ and devoted himself fully to his service. This book is an inspiring read of one of whom the world was not worthy. John Thornbury lives about ninety miles from Gettysburg, Pennsylvania where nearly 150 years ago the decisive battle in the great struggle known as the Civil War was faught. Bronze statues stand there representing the brave men who faught, and in some cases, died for what they believed. This book gave the author an opportunity to rediscover and present to our generation the life of a wonderful man of God who lived through these troubled times and who has suffered an undeserved anonymity: Spencer Houghton Cone. This is a story about a marvellous conversion, overcoming hardships through faith, the power of preaching, and the influence of a godly life. This book is not fiction, it is sober history. It tells of what actually happened, true stories of courage and faith. Such should nourish your inner spirit. Thornbury is a Southern Baptist Minister with a doctorate in Ministry, a BA and a Master's degree in Theology. He has been a minister since 1954 and has served his current church, Winfield Baptist Church, Union County, Pennsylvania, USA, since 1965. He has also had a local radio ministry for 28 years. He was founding member of American Baptist Evangelicals, PA, for whice he wrote the doctrinal statement.